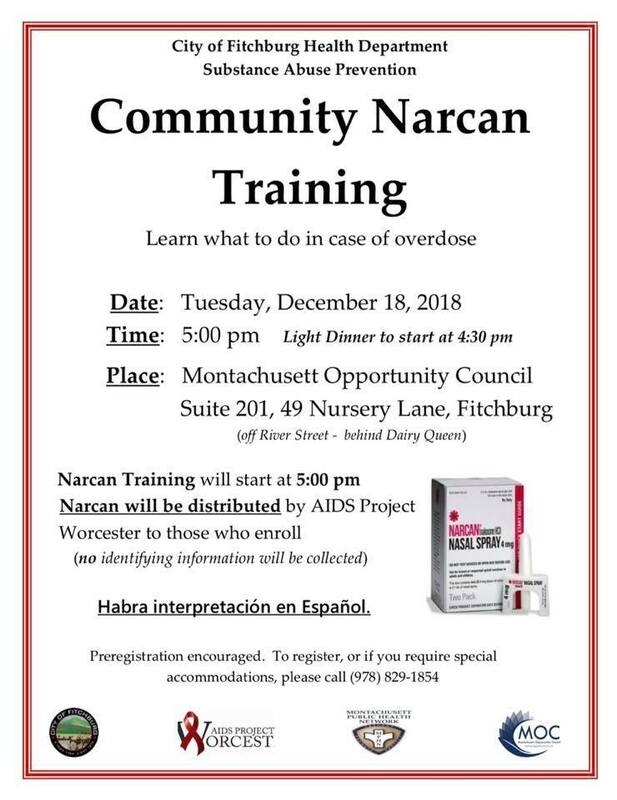 Free Narcan Training: Tuesday, December 18, 2018 at 5:00 pm at the Montachusett Opportunity Council (MOC), 49 Nursery Lane,Suite 201, Fitchburg. A light supper will be available at 4:30 pm. Narcan training will start at 5:00 pm. Attendees will be instructed on how to recognize an opioid overdose and what to do if one occurs. Narcan will be distributed by AIDS Project Worcester to those who enroll. No identifying information will be collected. Narcan blocks the opioids and restores normal breathing when sprayed in the nose of someone who has overdosed. It is safe, easy to administer and has no potential for abuse. Habra interpretación en Español. Pre-registration is encouraged. To register, or if you require special accommodations, please call: (978) 829-1854.